Dr. Robbins-Winters has been serving the vision needs of families in the Michiana area since 1992. She offers adult and pediatric eye care, general and specialty contact lens care, comprehensive eye health diagnosis and management and extensive optical services. She serves as a clinical consultant for leading contact lens manufacturers and is responsible for bringing new, breakthrough lens products into the Michiana area before they become widely available. She has served on the Vistakon Leadership Advisory Panel, and has been published in various professional journals on topics pertaining to contact lenses. In 2003, Dr. Robbins-Winters was appointed by Indiana Governor Kernan to serve a two-year term on the Indiana Optometry Board, which advised the state on professional licensing standards and eye care legislation. As the 2010-11 elected President of the Indiana Optometric Association, Dr. Robbins-Winters volunteers a significant amount of her personal time to represent the 760-member association. Locally, she provides free vision screenings to area school children, participates as a provider for the Vision USA program, and is a spokesperson for InfantSee, a non-profit organization that provides free eye examinations to infants six months to one-year of age through participating optometrists. After completing her undergraduate studies at the University of Wisconsin-Eau Claire, Dr. Robbins-Winters attended Indiana University School of Optometry where she received her Doctor of Optometry in 1991. She received her Bachelor of Science in Optometry in 1988. While a student, she served as co-president of the Beta Sigma Kappa Optometric Honor Fraternity, was an active member in the Indiana University Optometric Student Association, and was selected as a contact lens teaching assistant. She graduated optometry school with honors and was the recipient of multiple awards including the Fisons Corporation Award for Clinical Excellence, Bausch and Lomb Practice Initiation Award, and the William Feinbloom Low Vision Award. Her graduate thesis was accepted at The Bausch and Lomb National Research Symposium in Toronto, Canada in 1991. After completing a postgraduate residency in Ocular Disease and Geriatric Care at the Portland, Oregon VA Outpatient Hospital in 1992, she received certificates of completion from Pacific University School of Optometry and Pennsylvania School of Optometry. In 2007, Dr. Robbins-Winters completed the Chief Executive Optometric Program held at The Wharton School of the University of Pennsylvania. She participates in ongoing professional education through conferences and seminars throughout the year. 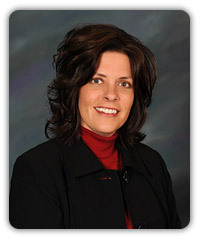 Dr. Robbins-Winters was the 2010-11 elected president of the Indiana Optometric Association. In this capacity, she represented 760 optometrists in matters of legislation, continuing education, and professional licensing. Prior to this position, she served on the Executive Board of the Association in the capacity of President-Elect, Vice President, and Secretary/Treasurer. She also served four years on the Indiana Optometric Association Board of Trustees. She is a member of the American Optometric Association, and a charter member of its Contact Lens Section. Originally from Illinois and Wisconsin, Dr. Robbins-Winters resides in New Carlisle with her husband Joe Winters, a native of Dowagiac, Michigan, and their two daughters Jordan and Jaiden. Joe is a Project Manager/Estimator at Rosema Construction in South Bend, Indiana. When Dr. Robbins-Winters and her husband are not working, they enjoy golfing together and spending family time at their lake condo in North Webster, Indiana.